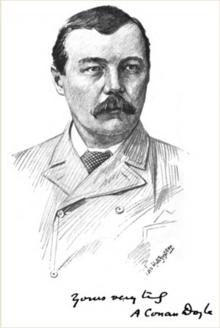 Doyle is often referred to as "Sir Arthur Conan Doyle" or simply "Conan Doyle" (implying that Conan is part of a compound surname, as opposed to his given middle name). His baptism entry in the register of St Mary's Cathedral, Edinburgh gives "Arthur Ignatius Conan" as his given names, and "Doyle" as his surname. It also names Michael Conan as his godfather. The cataloguers of the British Library and the Library of Congress treat "Doyle" alone as his surname. Steven Doyle, editor of the Baker Street Journal, has written: "Conan was Arthur's middle name. Shortly after he graduated from high school he began using Conan as a sort of surname. But technically his last name is simply 'Doyle'." When knighted, he was gazetted as Doyle, not under the compound Conan Doyle. 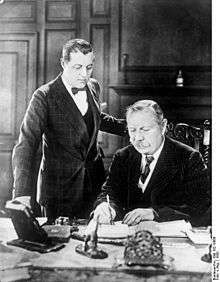 Nevertheless, the actual use of a compound surname is demonstrated by the fact that Doyle's second wife was known as "Jean Conan Doyle" rather than "Jean Doyle". Arthur Ignatius Conan Doyle was born on 22 May 1859 at 11 Picardy Place, Edinburgh, Scotland. 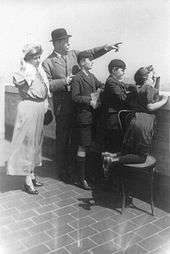 His father, Charles Altamont Doyle, was English, of Irish Catholic descent, and his mother, Mary (née Foley), was Irish Catholic. His parents married in 1855. In 1864 the family dispersed due to Charles's growing alcoholism and the children were temporarily housed across Edinburgh. In 1867, the family came together again and lived in squalid tenement flats at 3 Sciennes Place. Doyle's father died in 1893, in the Crichton Royal, Dumfries, after many years of psychiatric illness. Doyle struggled to find a publisher for his work. His first work featuring Sherlock Holmes and Dr. Watson, A Study in Scarlet, was taken by Ward Lock & Co on 20 November 1886, giving Doyle £25 (£2500 today) for all rights to the story. The piece appeared one year later in the Beeton's Christmas Annual and received good reviews in The Scotsman and the Glasgow Herald. Holmes was partially modelled on his former university teacher Joseph Bell. 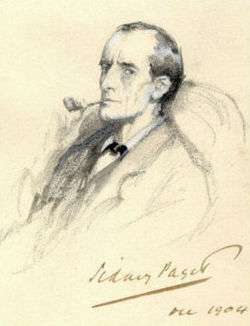 In 1892, in a letter to Bell, Doyle wrote, "It is most certainly to you that I owe Sherlock Holmes ... round the centre of deduction and inference and observation which I have heard you inculcate I have tried to build up a man." and, in his 1924 autobiography, he remarked, "It is no wonder that after the study of such a character [viz., Bell] I used and amplified his methods when in later life I tried to build up a scientific detective who solved cases on his own merits and not through the folly of the criminal. Robert Louis Stevenson was able, even in faraway Samoa, to recognise the strong similarity between Joseph Bell and Sherlock Holmes: "My compliments on your very ingenious and very interesting adventures of Sherlock Holmes. ... can this be my old friend Joe Bell?" Other authors sometimes suggest additional influences—for instance, the famous Edgar Allan Poe character C. Auguste Dupin. Dr. (John) Watson owes his surname, but not any other obvious characteristic, to a Portsmouth medical colleague of Doyle's, Dr James Watson. Doyle's attitude towards his most famous creation was ambivalent. In November 1891 he wrote to his mother: "I think of slaying Holmes,... and winding him up for good and all. He takes my mind from better things." His mother responded, "You won't! You can't! You mustn't!" In an attempt to deflect publishers' demands for more Holmes stories, he raised his price to a level intended to discourage them, but found they were willing to pay even the large sums he asked. As a result, he became one of the best-paid authors of his time. Jane Stanford compares some of Moriarty's characteristics to those of the Fenian John O'Connor Power. 'The Final Problem' was published the year the Second Home Rule Bill passed through the House of Commons. 'The Valley of Fear' was serialised in 1914, the year Home Rule, the Government of Ireland Act (18 September) was placed on the Statute Book. Though he later wavered, he remained fascinated by the paranormal. He was a founder member of the Hampshire Society for Psychical Research in 1889 and joined the London-based Society for Psychical Research in 1893. He joined Sir Sidney Scott and Frank Podmore on a poltergeist investigation in Devon in 1894. Nevertheless, during this period, he remained in essence a dilettante. He was later reinterred together with his wife in Minstead churchyard in the New Forest, Hampshire. Carved wooden tablets to his memory and to the memory of his wife, originally from the church at Minstead, are on display as part of a Sherlock Holmes exhibition at Portsmouth Museum. That inscription reads, "Blade straight/Steel true/Arthur Conan Doyle/Born May 22nd 1859/Passed on 7th July 1930." The epitaph on his gravestone in the churchyard reads, in part: "Steel true/Blade straight/Arthur Conan Doyle/Knight/Patriot, Physician, and man of letters". 1 2 The London Gazette: no. 27494. p. 7165. 11 November 1902. Retrieved 28 May 2013. ↑ "Scottish writer best known for his creation of the detective Sherlock Holmes". Encyclopaedia Britannica. Retrieved 30 December 2009. ↑ Lellenberg, Jon; Daniel Stashower; Charles Foley (2007). Arthur Conan Doyle: A Life in Letters. HarperPress. pp. 8–9. ISBN 978-0-00-724759-2. ↑ Pascal, Janet B. (2000). Arthur Conan Doyle: Beyond Baker Street. Oxford University Press, p. 139. 1 2 3 4 Carr, John Dickson (1947). The Life of Sir Arthur Conan Doyle. ↑ Panek, LeRoy Lad (1987). An Introduction to the Detective Story. Bowling Green, OH: Bowling Green State University Popular Press. p. 78. ISBN 0-87972-377-7. Retrieved 4 January 2012. ↑ Juson, Dave; Bull, David (2001). Full-Time at The Dell. Hagiology Publishing. p. 21. ISBN 0-9534474-2-1. ↑ "London County v Marylebone Cricket Club at Crystal Palace Park, 23–25 Aug 1900". Static.cricinfo.com. Retrieved 2 March 2010. 1 2 Leeman, Sue, "Sherlock Holmes fans hope to save Doyle's house from developers", Associated Press, 28 July 2006. ↑ Spiring, Paul. "B. Fletcher Robinson & 'The Lost World'". Bfronline.biz. Retrieved 2 October 2011. ↑ Roughead, William (1941). "Oscar Slater". In Hodge, Harry. Famous Trials. 1. Penguin Books. p. 108. ↑ Beresiner, Yasha (2007). 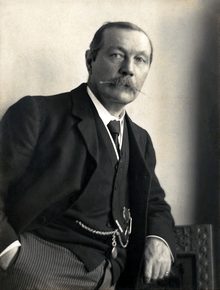 "Arthur Conan Doyle, Spiritualist and Freemason". Masonic papers. PIETRE-STONES REVIEW OF FREEMASONRY. Retrieved 13 March 2015. ↑ Wingett, Matt (2016). Conan Doyle and the Mysterious World of Light, 1887–1920. Life Is Amazing. pp. 19–32. ISBN 978-0-9-5724135-0. 1 2 Wingett, Matt (2016). Conan Doyle and the Mysterious World of Light, 1887–1920. Life Is Amazing. pp. 32–36. ISBN 978-0-9-5724135-0. ↑ Wingett, Matt (2016). Conan Doyle and the Mysterious World of Light, 1887–1920. Life Is Amazing. pp. 43–44. ISBN 978-0-9-5724135-0. ↑ Wingett, Matt (2016). Conan Doyle and the Mysterious World of Light, 1887–1920. Life Is Amazing. pp. 44–48. ISBN 978-0-9-5724135-0. ↑ Price, Leslie (2010). "Did Conan Doyle Go Too Far?". Psychic News (4037). ↑ Ian Topham (31 October 2010). "The Ghost Club – A History by Peter Underwood". Mysteriousbritain.co.uk. Retrieved 28 May 2013. ↑ Wingett, Matt (2016). Conan Doyle and the Mysterious World of Light, 1887–1920. Life Is Amazing. pp. 160–161. ISBN 978-0-9-5724135-0. 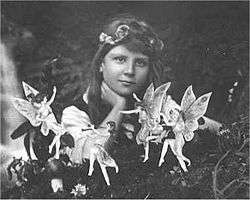 ↑ "The Coming of the Fairies". British Library catalogue. British Library. Retrieved 12 June 2013. ↑ Massimo Polidoro (2011). "Photos of Ghosts: The Burden of Believing the Unbelievable by Massimo Polidoro". Csicop.org. Retrieved 5 December 2013. ↑ Arthur Conan Doyle Interviewed on Sherlock Holmes and Spirituality. 16 April 2009 – via YouTube. ↑ ""Piltdown Man: Britain's Greatest Hoax" 17 February 2011 BBC". Retrieved 5 October 2014. ↑ ""Piltdown Man: British archaeology's greatest hoax" The Guardian 5 February 2012". the Guardian. Retrieved 5 October 2014. ↑ Limited, Alamy. "Stock Photo – Wooden headstone of Sir Arthur Conan-Doyle at a special display in the Town's museum. Portsmouth, Hampshire, UK". Alamy. Retrieved 15 March 2016. ↑ "City Museums". www.portsmouthcitymuseums.co.uk. Retrieved 15 March 2016. ↑ Duncan, Alistair (2011). An Entirely New Country: Arthur Conan Doyle, Undershaw and the Resurrection of Sherlock Holmes. MX Publishing. ISBN 978-1-908218-19-3. ↑ "Sir Arthur Conan Doyle house development appeal upheld". BBC News. 12 November 2012. Retrieved 12 November 2012. 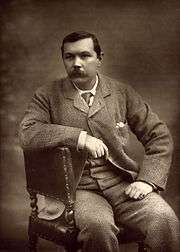 ↑ "Arthur Conan Doyle (1859–1930), author database), librarything.com; retrieved 17 March 2012.". Retrieved 5 October 2014.